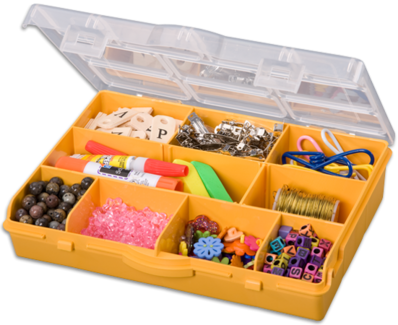 10 -compartment storage box with removable dividers. Easy scoop design for convenient access to small parts. Clear see-through lid allows you to see the contents at a glance. Cover firmly snaps shut to secure contents. Available in red, yellow, green, light blue, metallic green and bronze.